As most of you know, for the past of couple months I have been on the road on The Practice book tour. I’ve learned so much and it has been such an invaluable experience to me. Being on a book tour, and trying to “promote” a product and a person, I have found myself on social media, ALL the time. Whether I am posting about events or even just checking in with my world at home, I noticed myself habitually checking social media, even without truly realizing that I’m doing it. I also started to notice that I wasn’t feeling so great emotionally, and started to see a correlation with being online so often. This all made me think about the role social media has in my life, and what I’ve learned about it thus far. Social media is amazing, Peaceful Mind Peaceful Life would not be what it is today without it. We are able to reach millions of people all over the world to share the message of inner empowerment and peace. However on the flip side, social media can be a bit of a drag and energy vampire, if used too frequently and for the wrong reasons. I know many people feel that they get sucked into social media and feel bad because of it. If you’re feeling like you’ve been on a social media binge and need a digital detox, check out these lessons below, and start to re-evaluate your online presence, come back to your true self in the physical world and rediscover your own peace-of-mind. Be unapologetically yourself. Just like in day-to-day life, it’s so important to be you, and not worry about what others think about that! Don’t post or write something that isn’t completely true to who you are, and be confident in yourself, even on the internet. Social media popularity does not equal self worth. We get into the idea that the more fans, followers, and friends we have, the more liked and even loved we are. It’s a bit of a popularity contest, when in reality; It can be a false facade. Feel confident in yourself regardless of your online presence. You are so much more than a number online! Don’t try to please others. We (myself included) try to post things that we think people will “like” and feel inclined to share. From this mentality we get more into posting things just to do it rather then having a real purpose. Don’t post for likes, post when your soul feels urged to share something. Quality not quantity. Sometimes we think we need to post as much as we can to maintain a certain presence or keep up a reputation online. Doing that just for that purpose can sometimes have the opposite effect. Whenever I go to post something online, I really stop and think about what the purpose of the post is, and if it is truly necessary, and even beneficial to those who will see it. Moderation is key. Allow yourself a certain amount of time on social media and then give yourself a break. I’ve found that when I spend too much time online I feel disconnected and not present. It also shifts my thoughts into a more negative space and brings down my energy level. Have an intention and purpose with your posts, and don’t get sucked in to mindless wandering. When venturing on to your social media profiles, have a purpose and set an intention. Even if it is just to check out what’s going on that day or what your favorite blogger has to say, know in your mind that you have a reason for being online, and then once that purpose is served, disconnect. Drop the fear of missing out. We see people posting about amazing events or cool situations and we feel like we are left out of the fun. Just remember people will usually post the super exciting parts of their lives, not the mundane parts. Everyone has magnificent parts of their lives, and everyone has boring moments. Know that your life is amazing just as it is, and you don’t need to live vicariously through someone else. Don’t compare! We all know that comparing brings heartache and unease, so just don’t do it! When we get into that number mentality of more is better we start to put a value on our lives based on our online presence. We are all different and all have strengths and weaknesses. Don’t allow your social media statistics to define who you really are; allow your real self to shine through. Give purpose and use your presence to serve the world. Like I said before, social media gives great organizations, like Peaceful Mind Peaceful Life, a platform to inspire and serve the world. Writing for such an organization makes me want to elevate all levels of my life, and give purpose to my own personal social media sites. With the Internet we all have the capability of reaching people throughout the world, and share the message we are meant to spread. Use this tool wisely and spread love and empowerment with your online presence. Don’t take it too seriously! Social media, just like life, is meant to be fun and enjoyed. Don’t overthink it, don’t take it too seriously, and just enjoy the positive aspects that it brings to life! 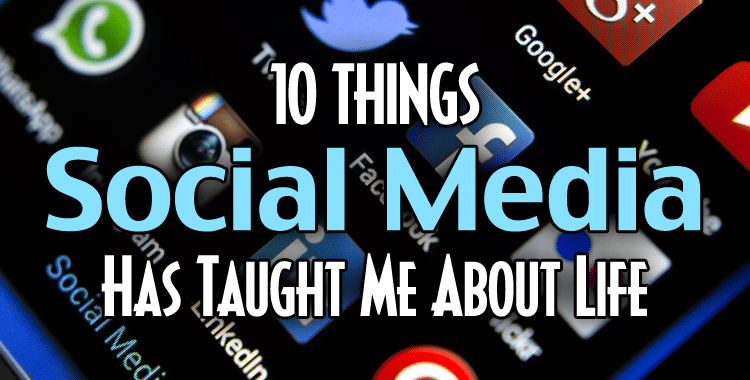 What have you learned about yourself and your life from social media? What do you do to make sure you keep yourself in balance with your online time? I’d love to hear from you in the comments below!